The scoring started early for the 6th-seeded ’82-’83 Edmonton Oilers, yet again. Defenseman Charlie Huddy started what would end up being a four-point night for himself with a goal a little over four minutes into the opening period. Fellow defenseman Paul Coffey followed that up with a goal almost exactly four minutes later. In desperate need of a goal, the 15th-seeded ’95-’96 Colorado Avalanche got one nearly halfway through the first period courtesy of Claude Lemieux, his 16th of the tournament. The first period ended at 2-1 in favor of the Oilers, but Edmonton held a major shot advantage, 22-9. The game began to get out of control, in terms of the score, in the second period. Pat Hughes scored his fourth of the tournament two minutes and change into the second period to give the Oilers a 3-1 lead. He then potted his second of the game just two and a half minutes later after goaltender Patrick Roy left a rebound off of a shot from Tom Roulston. Then, just about a minute later after that, Wayne Gretzky scored his 25th to make it 5-1, which caused Colorado to pull Roy for backup Stephane Fiset. The Oilers continued to pour it on in the second period with Gretzky scoring his second of the game with a little over four minutes left in the period, again off of a rebound, this time from Huddy shot. 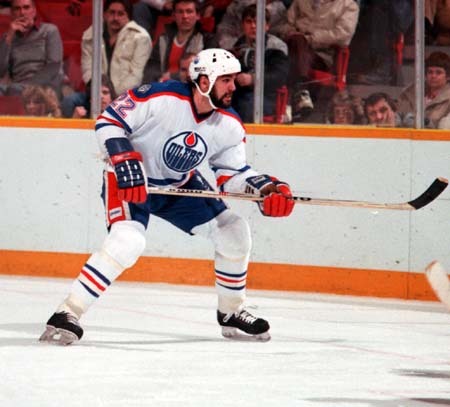 Gretzky completed his hat trick eight and a half minutes into the third period as Edmonton stretched their lead to six. The Avalanche got one back less than a minute later courtesy of Martin Rucinsky, but they still trailed by five with only 10+ minutes left. Huddy potted his second of the game at the 14:40 mark to reinstate Edmonton’s six-goal lead and basically end the game at that point. However, Colorado would continue cut the Oilers’ lead down. Valeri Kamensky scored his eighth of the tournament at the 15:27 mark to make it 8-3. Then, just 22 seconds later, Joe Sakic potted his 16th to cut the lead in half to 8-4. Finally, the Avalanche were able to cut the lead down to 8-5 when Adam Deadmarsh scored his third of the tournament, but that would be the final as Edmonton clinches their second straight berth in the Ultimate NHL Final. The Final of the Third Annual Ultimate NHL Playoff is set! It is a franchise rematch! The top-seeded ’76-’77 Montreal Canadiens will face the 6th-seeded ’82-’83 Edmonton Oilers! The Ultimate NHL Final begins on Monday night! It will be tweeted live from the Ultimate NHL Playoff twitter account, which you can find here. This entry was posted in Semifinal, Ultimate NHL Playoff and tagged Adam Deadmarsh, Charlie Huddy, Claude Lemieux, Colorado Avalanche, Edmonton Oilers, Joe Sakic, Martin Rucinsky, Pat Hughes, Patrick Roy, Paul Coffey, Semifinal, Stephane Fiset, Tom Roulston, Ultimate NHL Playoff, Valeri Kamensky, Wayne Gretzky. Bookmark the permalink.